Today is the first, non author, stop on Rebecca Bryan’s Modern Triangle Quilts book blog tour! That’s a lot of pressure by the way, having the post right after the author’s post. About a month ago I bought a new toy, a crafting toy to be exact! It’s a Silhouette Portrait and it is seriously my new favorite tool. I never really messed around with paper crafts before, and I’m not a scrapbooker, but I thought I could still find a use for it. Well, I found loads of uses actually and can’t wait to share them all with you guys. You’re probably wondering now what this has to do with the “WIN THIS” flag above, well I made the above paper cut using my machine and one of my animal doodles I mentioned on Monday. I made it purely to see if I COULD. I love experimenting and testing my limits, and this was one of the outcomes. I want to make some many more too!!! If you love wiener dogs, paper cut pieces or this piece just “speaks to you” (hahaha) then you can enter to win by just leaving a comment below. The comment can say anything. You can tell me about your day, what your favorite food is, what you think I should make next, or whatever else is on your mind! Please keep it nice and clean though, I guess thats the only rule. The print measures a total of 8.5″x11″, that includes the chipboard I mounted it to. You have until next Wednesday night to enter (January 22nd at midnight EST) , and I’ll choose a winner the next day!! Entries are closed for this giveaway! The winner is comment #3, Katie T.
I’ve contacted Katie, but if she doesn’t get back to me, then i will choose a second winner!! About four years ago I had a customer turned friend ask if there was anyway to turn a pair of my bee earrings into a tiny doll sized necklace. I took this as a challenge, I LOVE challenges. So I set out figuring out length and size and quickly put together a mini necklace. Well I actually put together about three dozen mini necklaces. It was fun and it used up all those little chain bits I had been hoarding for years. I didn’t have a doll of my own yet, so I sent the necklaces to my friend and asked if she could take product photos for me in exchange for the necklaces. You can see one of these photos here. Apparently there was a huge demand for little necklaces and I sold out super quick. So I just kept making more. I enjoyed all the new customers I was getting to know and the community they had built. Everyone was so nice and creative. I was sold on it all. I had to have a doll of my own! It wasn’t until after I had CT that I finally gave in and purchased myself a Blythe doll. She was a previously owned redheaded girl that I named Random (Trillian and Arthur Dent’s daughter from the Hitchhikers Guide to the Galaxy). I received her at the most perfect time, sorta. I had been admitted to the hospital for gallbladder problems and pancreatitis. It was during a snowstorm so I was in there for 8 days waiting for doctors who were snowed in. She arrived on the third day right before my surgery. My awesome husband brought her to the hospital along with a measuring tape and some sewing supplies. I used the downtime I had (when I wasn’t asleep from all the painkillers) to make a few patterns and such for my new doll. The first one was a little beanie similar to ones I had made CT before she was born. Actually it was the same pattern, just altered to fit Blythe’s huge head! I used my own fabric designs (which I guess should have been talked about during this timeline thing… oh well) and had them printed by Spoonflower. I actually sold a few of these beanies before I even had a chance to properly photograph them! Another happy accident. From there I started making shirts, dresses, skirts and more. It was a lot of fun designing for something so little and something that doesn’t really care how brightly colored or busy the patterns may be! I could make anything! Over the years I have made many little pieces, and the designing is still super fun. However the itty bitty tiny sewing has taken its toll on me. So this past year I started selling the pre printed dress patterns. So anyone who still wanted my designs could make them at a much cheaper cost! I’ve also added hand cast plastic blythe eyechips to the mix. It’s a brand new adventure, but i’m enjoying it just as much as everything else I do. This venture, like some of the others has enabled me to meet some of the most amazing people! I love talking to them and seeing what they create. I’m crossing my fingers that my plans to go to BlytheCon this year don’t fall through like previous years (something crappy always came up, like I was cursed). This year i’m going up with friends so that should help! I just want to meet all of these amazing people so bad. Are any of my readers going? 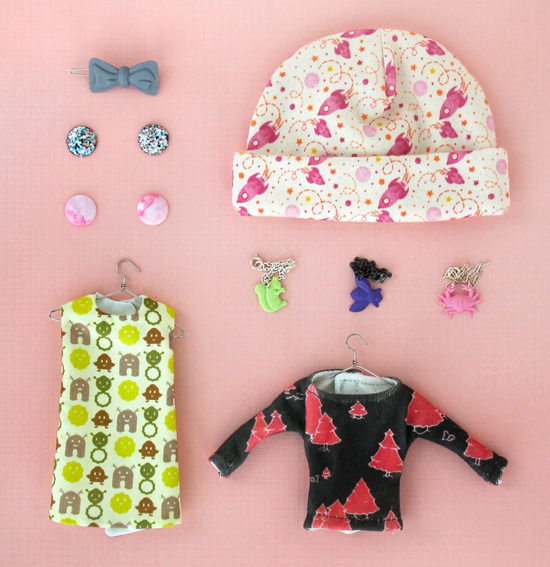 So as part of week four (the final week) of Art School Dropout’s 10 year anniversary, I am giving away all of the Blythe accessories pictured above plus two sets of our DIY dress kits (not shown)! This giveaway is for everything listed above, there will be no substitutions. The contest starts right this second and ends Sunday, June 2nd at 11 p.m. EST when comments will be closed. Since my weekends have been pretty busy lately, a winner will not be chosen until next Monday. The winner’s name will be added to this blog post soon after. Winner(s) will be contacted by email 48 hours after the giveaway ends. If the first winner does not reply back to an email sent out within 24 hours, a second winner will be chosen. So please make sure to give your correct email address! Each giveaway item will be shipped out the day the next giveaway starts until the fourth week when it will be shipped out three days later (unless something comes up, in which case I will email the winner). This weeks giveaway is open to international readers! Ask me a question! Any question! It could even be a rhetorical question! Haha. I liked the idea from previous giveaways of tweeting to earn a second spot. So if you add Art School Dropout on Twitter (username @jesseesuem) and/or tweet about this giveaway, please comment letting me know. Your comment will count as additional entries (just make sure its a seperate comment). So in the end everyone has the chance to enter three times! Good luck to everyone that enters! I am excited to see your questions. This giveaway is closed! Our giveaway is commenter #4 – Amy! She won everything pictured plus more! Thank you to everyone who entered! I won’t be doing another giveaway for a bit, but keep checking back for other goodies! This one isn’t super long or possibly even that interesting, ha. 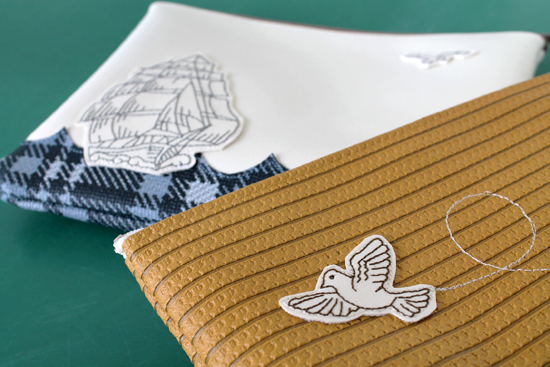 It’s all about how I started to incorporate sewn objects in our product range. Very soon after I started selling all those Juxtapose necklaces 10 years ago, I decided that I wanted to invest in a really nice sewing machine, possibly one with an embroidery unit. My mom and grandmother had vikings, so of course I felt I needed one too. I viewed it as a gift to myself for doing so well. I ended up finding one that I loved that also did small (3.75″x3.75″) embroidery. I was in love with all the deadstock vinyl I had been seeing at local mom and pop fabric shops at the time and made sure the machine could handle that too. It seriously took me close to three years to get comfortable enough with the material and embroidery to make pieces I felt I could sell. It also took that long to save up for the software and equipment so I could draw my own designs. Such a great investment. The whole thing. I am able to draw up any design I want that fits into that little square size, and embroider it on vinyl. I loved the little bags and pouches I was making. I still use a bunch of them to this day, as do most of friends and family members. I haven’t made any new pieces in a while but after assembling the ones above, i think I might have to get back into it!! Soo many ideas flowed through my head while sitting at my machine. I can’t wait until I have some free time! So as part of week three of Art School Dropout’s 10 year anniversary, I am giving away the two embroidered vinyl zipper pouches pictured above! One is 9″ wide and the other is 8″. Neither are lined, which makes them waterproof and great for things like makeup and toiletries. I use mine for change and some of CT’s small toys! This giveaway is for BOTH of the vinyl pouches shown in the above two photos, there will be no substitutions. The contest starts right this second and ends Sunday, May 26 at 11 p.m. EST when comments will be closed. Since this weekend is a holiday weekend in the states (and I have two birthdays to go to), a winner will not be chosen until next Tuesday. The winner’s name will be added to this blog post soon after. Winner(s) will be contacted by email 48 hours after the giveaway ends. If the first winner does not reply back to an email sent out within 24 hours, a second winner will be chosen. So please make sure to give your correct email address! Each giveaway item will be shipped out the day the next giveaway starts until the fourth week when it will be shipped out three days later (unless something comes up, in which case I will email the winner). What design, or type of design, do you think I should put on my next batch of bags and pouches? Last week we tried out rafflecopter, which in the end seemed like a mess and kinda confusing (thank you for the emails). I liked the idea of tweeting to earn a second spot. So if you add Art School Dropout on Twitter (username @jesseesuem) and/or tweet about this giveaway, please comment letting me know. Your comment will count as additional entries. Good luck to everyone that enters!!! I am excited to send these pieces to go to a great new home. This giveaway is now closed and a winner has been chosen. I used random.org to pick the winner, which ended up being commenter #2 – Robyn!! Thank you everyone for entering and keep an eye out for the last weeks giveaway starting soon! Today I will continue on with the 10 year anniversary “festivities”! When planning this I wanted to kinda have a theme with the giveaways. Last weeks was a Garden Necklace which showed the true start to Art School Dropout as a business and not just a hobby. This week I wanted to showcase the next step in my creative endeavours, which was hand cast plastic. I started making my own plastic pieces sorta by accident. I HAD been researching ways to reproduce some of the plastic flowers and such that I used in my necklaces. Demand was greater than supply at the time (this was before I started buying vintage pieces in super bulk). I could never find a way that would work for me, and there were loads of options. I just happened to be browsing one of the art stores in Baltimore while waiting for a ride (I believe it was my sisters birthday and she wanted to show off her new car) when I came across plastic casting supplies. They had everything you needed to make the mold and cast a bit of plastic. I bought some rubber, some plastic and three different pigments to try out. I was excited! I LOVE trying new things! The idea of adding a new skill to my list just makes me so happy. Casting plastic was seriously love at first pour. It was great. It felt just like making creepy crawlers as a kid. Which was something I did a LOT. (I still compare it the same way today when asked) Depending on what plastic I used it was almost instant gratification. My love of mixing and matching colors was also utilized, different drops or squirts of pigments produced different shades, and then different plastic reacted different to those shades, so the possibilities were endless. To this day, casting plastic is still my favorite craft to do. It’s been almost 8 years and I’m still not bored. Business wise it was awesome too! I was able to reproduce a bunch of vintage pieces in new vibrant, colorful forms. I could make a neon pink fly to go in your hair, or a lime green octopus to hang around your neck or a tan camera to wear on your finger. It was a lot fun, and I’m so glad my sister was late picking me up that day, otherwise I may not have stumbled on this awesomeness! So, to go along with the giveaway theme, I am giving away all the hand cast plastic pieces pictured above! (In the blue and yellow photo, I couldn’t fit it all nicely in one photo!) I tried to pick and choose as many different pieces as possible without going TOO overboard!! Woah, I feel crazy after listing it all off!! This giveaway is for ALL of the cast plastic pieces shown in the above two photos, there will be no substitutions. The contest starts right this second and ends Friday, May 17 at 11 p.m. EST when comments will be closed. At which time Rafflecopter will choose a random winner. The winner’s name will be added to this blog post soon after. Winner(s) will be contacted by email 48 hours after the giveaway ends If the first winner does not reply back to an email sent out within 24 hours, a second winner will be chosen. So please make sure to give your correct email address! Each giveaway item will be shipped out the day the next giveaway starts until the fourth week when it will be shipped out three days later. What is your favorite blog to read daily? Or if you’d like just link me to your own! If you don’t comment, your rafflecopter entry is invalid!!! This week we are going to try out Rafflecopter to help with the giveaway. It’s an awesome little widget that keeps track of everything and makes it easier to add us on such platforms as facebook and twitter. Make sure to log your comment in the widget, and if you would like you can earn more entries by adding us on Facebook, Twitter or tweeting about the giveaway. If you have any questions or concerns about this new process, please let me know! Also good luck to everyone that enters!!! I am excited to send these pieces to go to a great new home. This giveaway is closed and our winner is Lauren C! We also did a second place winner who will receive 10 items similar to some of those pictured above. Our second place winner is Erin H.
Big News! This week marks the 10th Anniversary of Art School Dropout as a brand! EXCITING!! Ten years ago this week I finally sat down and chose a name for my then very very small hobby like business. At the time I was just selling handmade bags to a local shop in Baltimore called 9th Life, but I had a feeling it could be more. So it needed a name. After a bit of thought, I came up with Art School Dropout, it fit kinda well with my past and with what I wanted to do. I’m glad I chose it! Fast forward to now. It’s been 10 years and the brand Art School Dropout has grown to be way more than I ever expected. I have expanded my line of what I make A LOT. I have grown as a crafter and artist. I have been able to travel the United States more than I thought I would in such a short time. I have met some of my favorite people in the world who continue to inspire and support me on a daily basis. It’s all amazing, and I couldn’t have done it without out all of you! When I say you, I mean all the loyal customers and readers, who support handmade and understand it’s worth and that there is a real person behind it all. So to say thank you, for the next four week I will be hosting a giveaway each Monday. I will choose an item each week that I feel represents the growth of Art School Dropout, items that helped me make it to 10 years! The first week’s giveaway will be representing the piece of jewelry that sped up Art School Dropout’s growth in the beginning. I made close to 1500 of these things in 10 years! So here we have a Garden Necklace, a piece that is very similar in style to the original Juxtapose Necklace. The later pieces were much larger and had more random pieces in them, you can see a lot of the pieces I made here. I know I’ve used this one before, but I seriously get so much inspiration from all the answers! I can’t wait to read the responses!! This giveaway happens to coincide with Sew Mama Sew’s biannual giveaway day. So after you’ve entered here, why not stop on by her blog and see what everyone else is offering! Also, if you are a new visitor because of giveaway day, WELCOME!! If your interested in any of the Juxtapose Necklaces that are available right now, check out the shop! Oh, and if you would like to keep up to date about the next three giveaways (one a week) why not add us on Facebook, Twitter, Instagram or follow us on your favorite blog reader! (my favorite is Bloglovin) I will be posting on all of those platforms each time a giveaway starts and right before one ends!! This giveaway is CLOSED! but keep an eye out all month, because each week we’ll have a new prize to win!! The winner was comment #92, Amber! whose favorite color combo included leopard! Ha, I love that! !